Kids love Halloween, and I love creating yoga classes centered around the holiday. 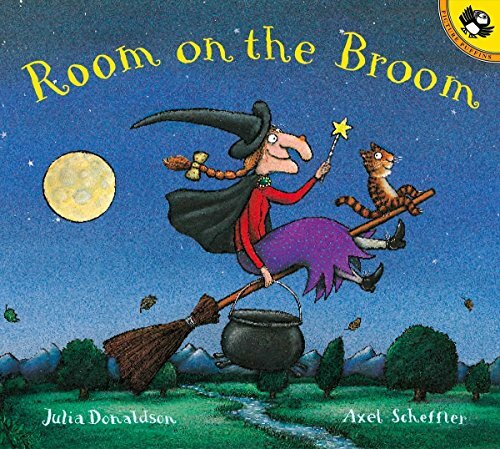 While I have developed a number of Halloween lesson plans over the years, I keep coming back to Room on the Broom by Julia Donaldson. It is one of my favorite books to use in class, as there are a lot of different animals and sounds to work with. The sequence below builds on itself, just like the story builds as more friends join the broom ride. I always like to engage the kids further by asking what the witch dropped OR who asked to join the broom ride. If time allows, have the kids circle up and pretend to mix a big cauldron. Then everyone says "Bubble, bubble, tricks and sticks, what would [child's name] like to throw in the mix? Make sure to give every child a turn. If you have even more time, you can make up a pose that corresponds to the item each child chooses to throw in. As always, have fun and make this lesson your own. Help support Backyard Yoga by clicking through our banner ad for all your Athleta purchases. It cost nothing extra for you but really helps support the time and effort going into managing this sit and all it's content.